His original conception of theThe Mars story was to present it as a musical. In 2007, Gordon had written a musical "Heart of Gold" which featured young people from Dundee and Glasgow's Red Road Project. The whole event was staged at the Fringe at The Edinburgh Festival to high critical acclaim and was sponsored by The Prince's Trust. HRH and Prince Harry even popped into rehearsals. Audio versions of all the songs are featured at the top of the page. (stories in the book) and also a pipe and drum band. The Mars musicians and choir took part in many concerts throughout Scotland and in England. Many of the boys became musicians in the British Forces after their discharge. 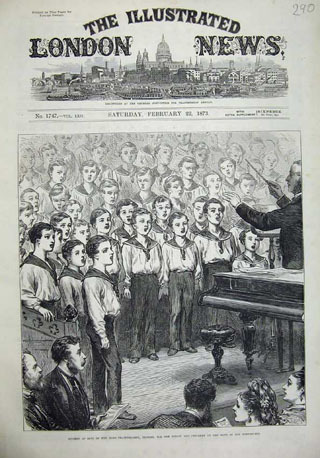 The picture below from The London Illustrated News, shows Mars Boys singing at Northfleet in 1873.